The statement importer makes day to day bookkeeping quick and accurate. It also has a number of additional features for power users and for more complex transactions and scenarios. The following are features of the statement importer that will speed up matching of transactions. inniAccounts learns your transactions as your enter details. When you start to type a description you will be presented with suggestions based on previous entries that you can select from to auto complete. When you use autocomplete inniAccounts will apply the completed description and also attempt to apply the VAT rate, category and paid to/from fields based on your previous transaction. To speed up working through your transactions in the statement importer, you can use keyboard shortcuts. To see the available shortcuts, press and hold the ALT key on your keyboard. Whilst holding the ALT key you can press the shortcut on your keyboard to activate the option. If you have regular outgoings from your business account, you can use the Regular payments & savings feature to create repeating inniAccounts transactions to speed up your matching to bank payments. Instead of having to enter details each time you have a regular outgoing, setting up a repeating transaction in the Regular payments & savings means you have a transaction in inniAccounts you can select to match against your bank payment. 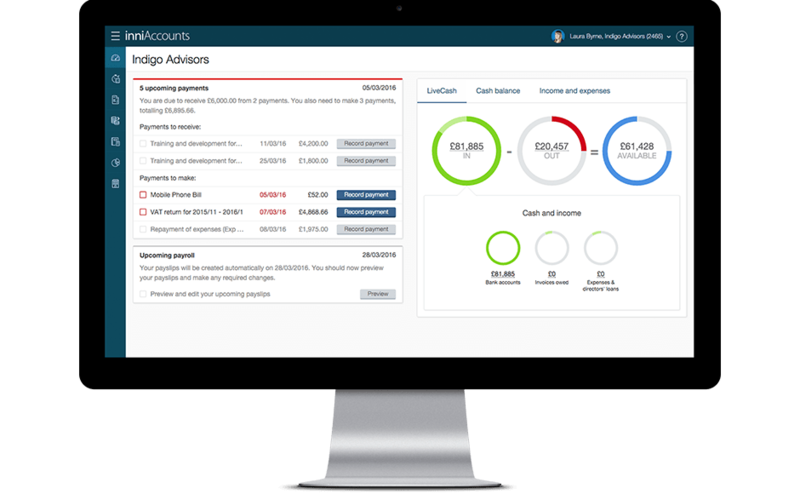 This will help with bank charges, accountancy fees, mobile phone contracts, hosting fees etc. This scenario applies when you have a payment on your bank statement that doesn’t match exactly your inniAccounts created transaction, for example an underpaid invoice. Locate your inniAccounts transaction the payment relates to and click the Match button. As the payment is not for the full amount, the balance due will remain in inniAccounts ready for when you receive the balance of the payment. If the difference is small (less than £1) and needs to be written off, click the Write off button to clear the balance. With any scenario where you have paid or received more than the inniAccounts transaction, for example if you have overpaid your PAYE payment to HMRC, please contact your Account Manager. If the payment relates to more than one inniAccounts transaction, read the next section to see how to split your payment. If you have a transaction on your statement that is made up of a number of your inniAccounts transactions, you can to split the payment. An example of this could be where you receive a single payment for several invoices. To split a transaction simply click the Split button instead of match. The importer will suggest transactions from your pending payment that you can select by ticking the checkbox to apply against the bank payment. If you need to create a new item for part of the payment because there isn’t a pending payment, click the New button. Before your can save the transaction you will need to ensure that the difference between the bank statement amount and the transactions you select or enter is zero. A message will be displayed that shows you the difference. There may be an instance due to small rounding errors in calculations that your payment differs by a few pence from your inniAccounts transaction. The most common cause are VAT rounding errors. You can use this feature if you over or underpay an inniAccounts transaction by an amount of less than £1.00. To use this feature, click Split and tick the check box against the inniAccounts transaction you need to use as normal. If the difference is less than £1.00 you can click the Write Off button that will appear automatically. If the difference is greater than £1.00, please contact your Account Manager. If you have incurred expenses as part of a bank payment of which part needs to be rebilled to a client, you will need split the transaction. An example is if you purchase three domain names, two for your business and one that you will rebill to a client. In this example, click the Split button against the bank payment and then click the New button. Enter the details of the first payment of the transaction, in this example the two domain names that were for your business. You then click the New button again and enter the details of the item that you will rebill and this time when you set the type to Expense, you will see the option to rebill your client – select the client you will rebill via an invoice later. This part of your payment will be available as an expense to rebill when you next create an invoice. Should you make a single payment for multiple items that need to have different accounting categories, it is important that you split the transaction to ensure your taxes are calculated correctly and your year end accounts are accurate. For example, if in a single payment on your bank statement you purchased a mobile phone and insurance, you will need to separate the items to categorise them individually. When you click the Split button you click New to enter the details of the mobile phone, i.e. enter the amount, description and select the category ‘Telephone’. The second part of the transaction would be for the balance of the payment for the insurance. Again, click New and enter details about the insurance and select the category for insurance. This also applies if you have a receipt where one item is VATable at 20% and another is exempt. Splitting the payment allows you to select the correct VAT rate for each. Note that this generally does not apply if you are using the Flat Rate Scheme for VAT unless the purchase is over £2,000. If you make a payment from your current account to your credit card or if you transfer funds between business accounts, you need to click New against the transactions. Set the type ‘transfer to another account’ and enter the details to explain the transfer. When you create a transaction for a transfer, the corresponding transaction will appear in that accounts list of transactions in inniAccounts that you will need to match / reconcile. If you are moving money between business accounts or credit cards, you will need to keep those accounts reconciled too. If that account is not enabled for bank feeds you will need to reconcile using this method. When using the statement importer, once you have matched a transaction generally it cannot be edited. However, if the transaction has not been included on a VAT return and provided the transaction is an expense, you can edit the description, accounting category, VAT rate and whether it is a billable expense. Simply click the pencil icon in the transaction to make changes. If you are unable to edit a transaction after it has been included on a VAT return, please contact your account manager. If you find a problem that you cannot resolve by editing it using the method above and, provided the transaction has not been included on a VAT return submissions, you can roll back your transactions from the statement importer screen by clicking the undo button on the transactions until you reach the transaction you need to correct. When bank feeds are enabled on an account, transactions must be removed / undone using the importer screen. This cannot be done in the bookkeeping screen for accounts that have bank feeds enabled.